Cygnett has released its latest product for iPods and other media players, the GrooveBassball portable speaker. The device integrates a rechargeable battery, claimed to last for three hours of playback time. 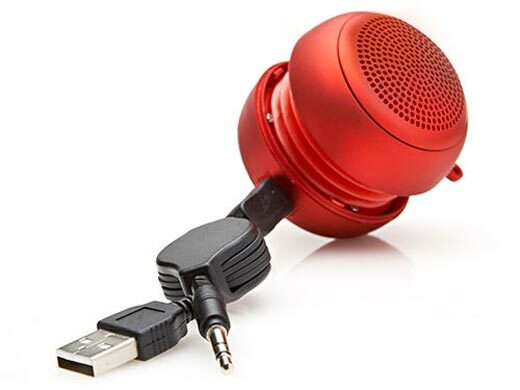 The speaker resembles the shape of a ball, but extends when the end is twisted. The additional length is designed to improve bass response. A USB cable is included for recharging the lithium-ion cells. Any MP3 player or device with a 3.5mm jack can be connected. The device is similar to the collapsible iHome iH77, although the Cygnett speaker is a single mono speaker while the iH77 offers two sides for stereo audio. The GrooveBassball is now available in red, silver, or black color variants, from retailers such as Easyishop.co.uk, with a price of $30.